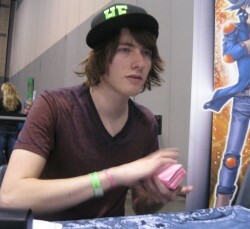 Robbie Stargel is one of many Duelists running a Dragunity Deck in today’s tournament. But his build is unlike most others. Stargel’s Dragunity Deck uses Assault Mode Activate and Stardust Dragon/Assault Mode! Stargel aims to Summon Stardust Dragon first turn, just like most Dragunity Decks, but then upgrade his Dragon into an even stronger form. Manny Vargas is running a Chaos Plant Deck packing a full 3 copies of Chaos Sorcerer. Those 3 copies of Chaos Sorcerer could spell trouble for Robbie Stargel, who relies on Level 8 monsters like Stardust Dragon which can easily be removed from the Duel by Chaos Sorcerer’s effect. Stargel opened up with Cards of Consonance; Dragunity Phalanx; Solemn Warning; Stardust Dragon/Assault Mode; and 2 copies of Bottomless Trap Hole. He activated Cards of Consonance to discard Dragunity Phalanx and draw Mirror Force and Pot of Avarice from the top of his Deck. He Set the Bottomless Trap Hole and ended his turn. Stargel drew Dragunity Aklys next turn. He Set it along with 4 Spells or Traps and passed. Vargas Set a monster and passed. Vargas passed his next turn without making a play. Stargel drew Giant Trunade and ended his turn. Vargas Set a card to his back row and passed. Stargel drew Dragunity Legionnaire and passed right back to Vargas. Stargel drew Dragunity Aklys and ended his turn. 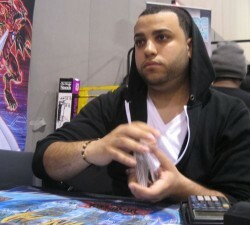 Vargas drew to 7 cards in his hand, then Set a monster and passed. Stargel drew Red-Eyes Darkness Metal Dragon next turn and passed. Vargas Flip Summoned Spore and Dandylion next turn. Then he Tuned Spore with Dandylion and Spirit Reaper to Synchro Summon Black Rose Dragon, and activated its effect to destroy all cards on the field! Stargel Chained Bottomless Trap Hole to remove the Black Rose Dragon from the Duel. After all cards were destroyed, Vargas Special Summoned 2 Fluff Tokens to the field. The Duel stood with Vargas at 8000 Life Points with 7 cards in his hand, and Stargel at 7700 Life Points with 6 cards in his hand. Vargas Normal Summoned Debris Dragon next, and activated its effect to Special Summon Dandylion from his Graveyard. He Tuned Dandylion with Debris Dragon and a Fluff Token to Synchro Summon Scrap Dragon, then Special Summoned 2 more Fluff Tokens from the effect of Dandylion. Scrap Dragon attacked Stargel directly, and Stargel dropped down to 4900 Life Points. Stargel drew Dragunity Dux next turn. He Summoned Dragunity Legionnaire and tried to activate its effect to equip it with a Dragunity Aklys that was in his Graveyard, but Vargas activated Effect Veiler to negate its effect! Instead, Stargel attacked a Fluff Token with his Legionnaire and ended his turn without a back row. An early draw of 2 copies of Stardust Dragon/Assault Mode turn Duel 1 into an uphill battle for Robbie Stargel and allow Manny Vargas to take a commanding victory. But if Stargel can Summon Stardust Dragon/Assault Mode early enough in the next 2 Duels, he may still be able to secure the Match win! Stargel opened up Duel 2 with Dragunity Dux; Dragunity Phalanx; Assault Beast; Mystical Space Typhoon; Pot of Avarice; and Solemn Warning. He Set Mystical Space Typhoon and Solemn Warning, along with Dragunity Phalanx, ending his turn. Vargas Set a monster along with 3 back rows and passed. In his End Phase, Stargel activated Mystical Space Typhoon to destroy Vargas’s newly Set Chain Disappearance. Stargel drew Assault Mode Activate next turn and passed. Stargel drew Solemn Judgment next turn and Set it along with Pot of Avarice. Vargas tried to Flip Summon Spirit Reaper next turn, but Stargel flipped Solemn Warning and gave up 2000 Life Points to negate its Summon. Stargel drew Bottomless Trap Hole. First, he pitched his Assault Beast to force Doomcaliber Knight to negate it. He then Normal Summoned Dragunity Dux and activated its effect to equip it with the Dragunity Phalanx that was sitting in his Graveyard. He Special Summoned the Dragunity Phalanx next, and Vargas flipped Torrential Tribute to try to wipe the field. Stargel thought for a while about activating Solemn Judgment to negate the Torrential Tribute, and eventually decided to do it. He gave up 3000 Life Points and his monsters survived. Stargel Tuned his Dux with his Phalanx to Synchro Summon Dragunity Knight – Vajrayana next, and then activated Vajrayana’s effect to equip it with the Phalanx in his Graveyard. Stargel used Vajrayana’s other effect next, in order to send Phalanx to the Graveyard and double Vajrayana’s attack. Vargas activated Dust Tornado to destroy Stargel’s face-down Pot of Avarice, and an attack from Vajrayana finished the turn. Vargas activated Dark Hole next turn to destroy Vajrayana, then Summoned Lonefire Blossom. He Tributed it to Special Summon another Lonefire Blossom from his Deck, then Tributed that one to Special Summon Dandylion from his Deck in Defense Position. Stargel drew Crevice into the Different Dimension, Set it, and passed. Vargas Set a back row and ended his turn. Stargel drew Dragunity Legionnaire and passed. Vargas ended his turn without making a play. Stargel drew another copy of Dragunity Legionnaire next turn. He Summoned one of them to the field and activated its effect to equip it with a Dragunity Phalanx. Then he activated the Phalanx’s effect to try to Special Summon it, but Vargas flipped Dust Tornado to destroy the Phalanx while it was equipped. Stargel attacked Dandylion with his Legionnaire, and Vargas Special Summoned 2 Fluff Tokens. Vargas Normal Summoned Card Trooper next turn and activated its effect to send Thunder King Rai-Oh, Solemn Judgment, and Mirror Force from the top of his Deck to his Graveyard and boost Card Trooper up to 1900 ATK. Then he attacked over Dragunity Legionnaire, dropping Stargel down to 2300 Life Points. Stargel drew Dragon Ravine next turn! He activated it and used its effect to pitch Dragunity Legionnaire from his hand and search his Deck for a copy of Dragunity Dux. He Summoned the Dux and equipped it with a Phalanx from the Graveyard. Then he Special Summoned Phalanx and Tuned it with Dux to Synchro Summon Vajrayana. He equipped Vajrayana with the Phalanx in his Graveyard, then Special Summoned the Phalanx to the field. Next, he Tuned Vajrayana with Phalanx to Synchro Summon Stardust Dragon, and used Stardust Dragon to attack a Fluff Token. Vargas attempted to activate the effect of Glow-Up Bulb next turn, but Stargel Chained Crevice into the Different Dimension to remove Glow-Up Bulb and Dandylion from Vargas’s Graveyard before he could Special Summon Glow-Up Bulb. Vargas activated Pot of Avarice next, sending Card Trooper, Thunder King Rai-Oh, Spirit Reaper, and 2 copies of Lonefire Blossom from his Graveyard to his Deck to draw 2 cards. He Special Summoned Chaos Sorcerer next, and activated its effect to try to remove Stardust Dragon from the Duel; but Stargel Chained Assault Mode Activate and Tributed Stardust Dragon! Vargas Chained Mystical Space Typhoon to the Assault Mode Activate in order to destroy Stargel’s face-down Bottomless Trap Hole, but Stargel Chained the Bottomless Trap Hole to remove Chaos Sorcerer from the Duel! Stardust Dragon/Assault Mode hit the field! Vargas Summoned Doomcaliber Knight and Set a card to his back row before ending his turn. Stargel drew Terraforming next turn and pitched it with his Dragon Ravine to search his Deck for a copy of Dragunity Legionnaire to add to his hand. Then he attacked Doomcaliber Knight with Stardust Dragon/Assault Mode, and Vargas activated Dimensional Prison to try to remove the Stardust Dragon/Assault Mode from the Duel. Stargel Tributed Stardust Dragon/Assault Mode to try to negate the Dimensional Prison, but Doomcaliber Knight Tributed itself to negate the effect of Stardust Dragon/Assault Mode and leave the Assault Mode monster in the Graveyard. Stargel Normal Summoned Dragunity Legionnaire in Main Phase 2 and activated its effect to equip it with Dragunity Phalanx. He Special Summoned the Phalanx and then Tuned it with Dragunity Legionnaire to Synchro Summon Ally of Justice Catastor, ending his turn. On his next turn, Vargas activated his Card Trooper’s effect by sending the top 3 cards of his Deck to his Graveyard. Then he Normal Summoned Effect Veiler and Tuned it with a Fluff Token to Synchro Summon Formula Synchron. He Special Summoned Chaos Sorcerer next, and activated its effect to remove Ally of Justice Catastor from the Duel. Then he finished off the Duel by Tuning Formula Synchron with Chaos Sorcerer to Synchro Summon Scrap Dragon. One direct attack from Scrap Dragon was more than enough to wipe out Stargel’s remaining 2300 Life Points! Manny Vargas takes a 2-0 victory over Robbie Stargel’s Assault Mode Dragunity Deck and advances to the third round undefeated with his Chaos Plant Deck!